The screen cover is a little thick and doesn’t sit completely flush to the screen requiring a heavy finger to get your command through and it takes some getting used to. A little clasp on the bottom allows full access to the charge and data port. It’s well designed for the included Apple charge cord to reach in there, but a port extender (available from LifeProof) will be needed for some docking situations. To let sound pass through, LifeProof has done well to use a super thin waterproof membrane that is cleverly protected from being exposed to any sharp or compromising objects. Naturally, some clarity is lost while using the regular phone mode though I’ve not received complaints from others while speaking to them on the phone. The speaker (either the speaker phone or listing to music) has some trouble as an air gap between the back of the case and the phone tends to create a buzzing with certain harmonics. I’ve found that placing the phone, face up, on some sort of cloth or something soft, elevates the buzz somewhat. As long as you’re not fixed on using the phone’s speaker, muted calls and buzzy music are easily solved by using headphones or a Bluetooth headset. But using headphones leads into another issue, the headphone jack plug, or bung, as LifeProof calls it. The bung is screwed into the top of the case to cover the headphone jack. When removed, it is a small object that is easy to loose. Conscious of this, LifeProof includes a spare and sells three packs of them in their store. If you’re looking to do some active water sports and want to have your tunes pumped into your head, you will need to trade the bung for the waterproof headphone adapter as well as purchase a set of waterproof headphones. You will also need to order the armband or belt clip separately. Just a few more accessories for you to keep track of. Though, with all this detail of issues I’ve mentioned above I still recommend this case. The level of protection it offers for the size it is, is worth pushing a little harder to reach the touch screen, keeping track of the bung, and I don’t use the speaker much. Like I said, I’m keeping it on my phone. Pro’s: Full time protection, full access to all switches, ports and touch screen functions, very slim, excellent shock/drop protection, rated to 6.6 feet (2m) underwater. 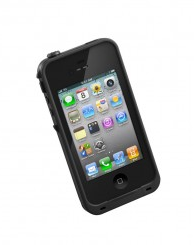 For a less permanent waterproof iPhone (or any phone, really) case check out the DryCase.